Commuter rail to Auckland’s North Shore will go ahead – but the project may still take decades to get underway. Auckland and the government’s transport agencies have confirmed that progress will be made this year to decide whether light or conventional rail will eventually cross the Waitemata Harbour. However, it could be decades before the project would actually get underway. An Auckland Transport report, released by the Green Party, shows that even with the current expansion of the North Shore Busway, choke points will appear in a decade’s time, and in 20 years up to five stations will struggle. The busway is one of the city’s biggest public transport successes, with patronage rising by 10 percent a year. Auckland Transport and the Transport Agency said it was always known the busway would reach capacity. Light rail has previously appeared in reports by government officials, but the politicians who would lead the decision-making – Auckland mayor Phil Goff and Transport Minister Simon Bridges – have been restrained in their enthusiasm. Auckland Transport is assessing the timing of an eventual switch from bus to rail, to ensure that the tentatively-planned cross-harbour tunnels can accommodate either option. It was also considering further improvements to extend the life of the busway. Auckland’s newest commuter train station opens in Parnell this morning. The station is the closest to the downtown terminus at Britomart, and sits adjacent to Auckland Domain. It features the 108-year-old Newmarket Station building which was moved on to the site. In peak hours trains, from the Southern Line will stop at Parnell. Off-peak, Western Line trains will also stop there. The development will eventually cost $19 million once a second stage with improved access is completed, and up to 2000 passengers are expected to use it during the morning rush hour. Construction of the 1.7 kilometre-long tunnel is expected to being in 2018. Pictured is an artist’s impression of what the entrance to the tunnel will look like. 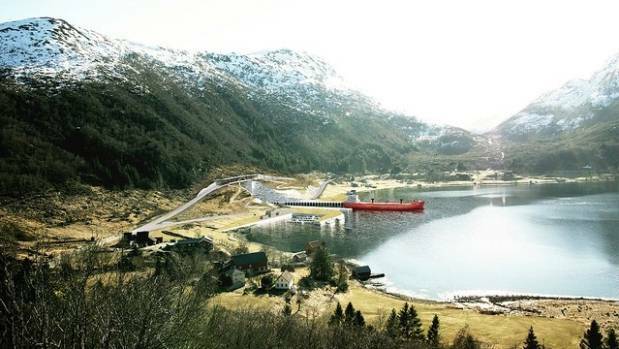 The world’s first ship tunnel is set to be excavated beneath a Norwegian mountain. 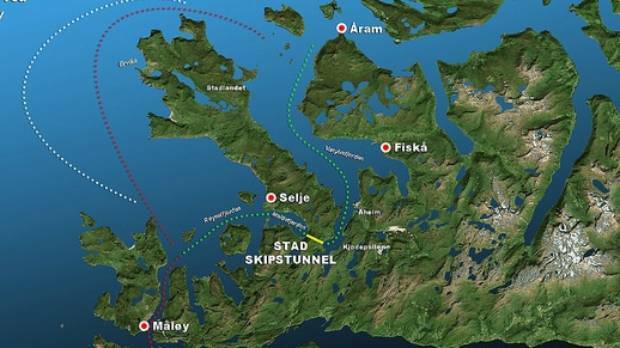 Measuring an expected 1.7 kilometres, the Stad tunnel will allow sailors to bypass a notorious section of the Stadhavet Sea – which has claimed 33 lives in the past 70 years and experiences 100 storm days each year, according to reports. But the tunnel will not provide a faster route than the current option, just a safer one. 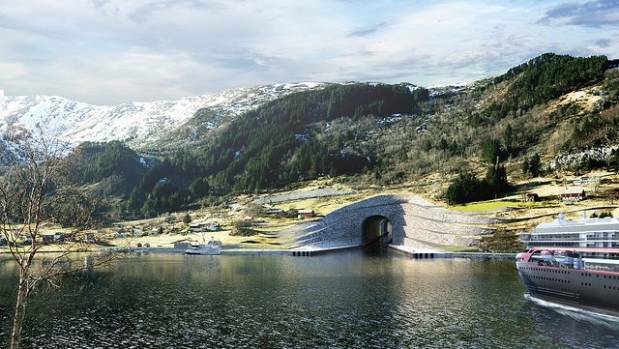 The Stad tunnel will allow boats to pass underneath a mountain as pictured. 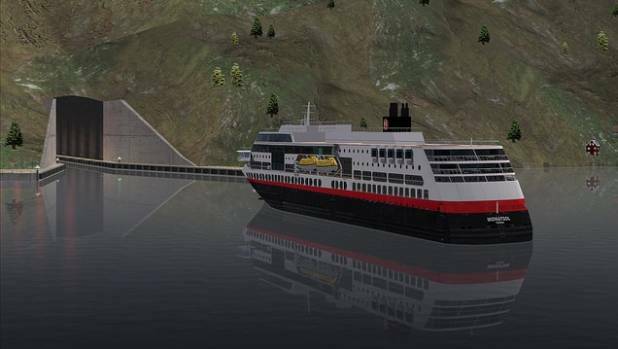 Construction on the tunnel – which will allow large vessels to pass through – is expected to begin in 2018 and cost NZ $460 million. 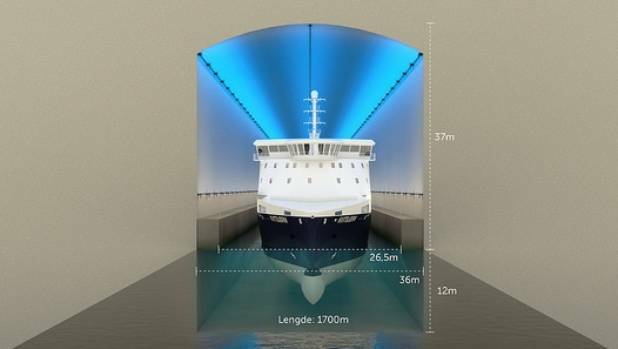 Dimensions for the tunnel vary according to reports, but a diagram provided by the Norwegian Coastal Administration, the group responsible for the project, say it will be 37 metres tall, 36m wide and have a water depth of 12m. A map shows the location of the Stad tunnel and the present, much longer route. Excavating the tunnel will require the removal of about 3m cubic metres of rock, according to gCaptain. Construction is to be carried out with standard blasting and drilling methods and is estimated to be completed in 2029, but could take longer. An overhead bridge for tourists in the tunnel has also been proposed, according to gCaptain. 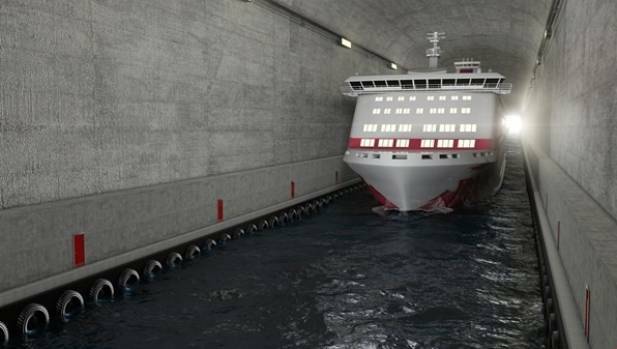 The proposed tunnel will be 37 metres tall, 36m wide and 1.7 kilometres long, with a water depth of 12m. As well as providing a safer route for ships, the tunnel is expected to boost shipping, fishing and tourism industries. The tunnel’s construction had support from all the country’s major political parties, it was reported. An artist’s impression of how one of the entry points for the Stad tunnel would look. The project is expected to have a positive effect on shipping, fishing and tourism industries, among others. Please be advised that we remain on target for the introduction of the ContainerChain VBS to MetroPort Auckland, commencing Monday 20 March 2017. As of this date, it will be a prerequisite to create truck arrival notifications via the ContainerChain booking system prior to the truck arrival at MetroPort Auckland. The VBS will be available for operators to book transactions from Friday 17 March 2017. Although it will be a prerequisite to create notifications from Monday 20 March, a six-week “zero invoice” period will remain in place to allow customer and operator process to adjust to the system introduction. After this period, commencing Monday 1 May 2017, a base fee of $6.50 + GST will apply to each notification made. The terms and conditions of entry to MetroPort Auckland for Container Transport Operators are outlined within the MetroPort Carrier Access Arrangements (CAA). It is a requirement for Container Transport Operators to agree with this arrangement prior to enabling access to the ContainerChain booking system. Rates are posted on the Port of Tauranga web site under “Tariff & Terms” and form part of the terms and conditions of entry. If you have any questions regarding the use of the booking system or the terms and conditions, please contact 0800 MET VBS or ContainerChain NZ on 0800 702 302. It’s that time of year when traffic in Auckland turns into post-holiday hell – and Auckland Transport says it’s using all possible resources to make ‘March Madness’ run more smoothly than last year. Auckland Transport recevived more than 1000 complaints last March about the lack of buses and trains to cope with the rush of people going back to work, school and university. The phenomenon is real: during March, traffic on the motorways increases and the number of people catching public transport goes up by 30 percent. This year, Auckland Transport is putting on more services to meet demand including 56 more city-bound bus trips every morning. Operations manager Brendon Main said 1200 more seats would be made available on peak hour trains from 12 March. “This is as much as we believe we will need to tackle some of the issues encountered last year. Mr Main said a lot of planning had been done to avoid the chaos of last year when buses were overcrowded, late or failed to show up during March. “We’re out there monitoring the situation as it happens. Transport Blog editor Matt Lowrie said the extra services were desperately needed. “Services are extremely busy; trains have been jam-packed, sometimes people can’t get on. It was great Auckland Transport was putting on extra services before the mad rush began, Mr Lowrie said. Transport Agency highway manager Brett Gliddon said the agency would be encouraging people to ride share and avoid travelling during peak times. “Together with Auckland Transport we’ll continue to monitor and manage the entire Auckland transport network through the Auckland Transport Operation Centre, which operates 24 hours a day 7 days a week. Forget waving your fist at that driver hurtling past you in a priority lane – electric vehicles are allowed to zoom down Auckland motorway on-ramps for the next two weeks. Air New Zealand was the most bullish about the trial. “We are looking forward to participating in this trial and hope our customers are inspired to consider electric vehicles themselves,” the airline said in a statement. Auckland Transport is known to be unhappy about the trial, and in a submission, posed questions about how clearly motorists would understand which vehicles qualified and called for an “information campaign”. “We note that the period of the trial will not provide any definitive conclusion on the effectiveness on driver behaviour change,” the city agency wrote. “The benefit is incredibly marginal. If you were really genuinely seeking a shift in New Zealand to a more sustainable transport economy, you wouldn’t start here,” he said. “The minister’s very keen on it. He wants to trial it, fine. That’s a decision he’s made. Let’s see if it works and if it doesn’t he’ll be the first to put up his hand and say well, ‘that didn’t work’,” said Mr Goff. “We’re also going to be monitoring commentary on Facebook and on social media, and also talking to the main stakeholder groups about their insights – the Bus and Coach Association, and freight operators,” said Mr Brodnax. The New Zealand Transport Agency’s traffic cameras showed North Shore-bound traffic was crawling on the Upper Harbour motorway. Auckland’s motorways are crawling as “March madness” begins in earnest. “March madness” happens each year when schools, universities and workers are all back on deck and traffic on the region’s motorways hits its peak for the year. A crash on the North Shore and two truck breakdowns on the southern motorway were contributing to delays as workers and university and school students tried to make their way into the city. The New Zealand Transport Agency (NZTA) tweeted about 7am on Wednesday that congestion had begun to build early. 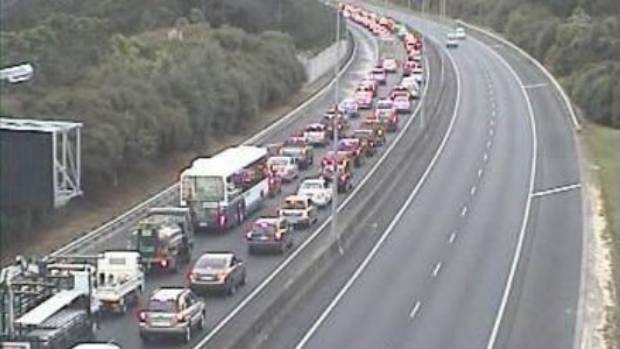 A crash on Albany Highway had caused a massive traffic backlog on the Upper Harbour motorway, between northwest Auckland and the North Shore, the agency said. On the busy southern motorway, a truck broke down in the northbound lanes just before the Greenlane offramp about 7am. A second truck broke down 40 minutes later near the Princes St offramp, near Otahuhu. Both trucks were clear of the lanes by 7.50am, but the agency was warning that drivers would face lengthy delays most of the way into the city. Earlier, a person died after a van hit a tree in the rural south Auckland suburb of Pukekohe. Paparata Rd was closed between Pinnacle Hill Rd and Totara Rd and people were being asked to avoid the area. Auckland Transport had put on additional public transport services, including four double-decker buses, but was still warning people to allow extra time to get to work or university. 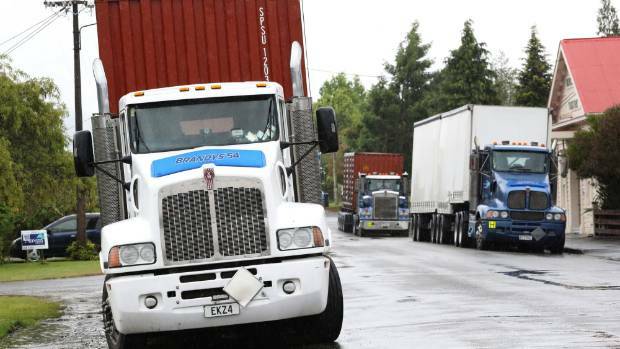 Trucks park at Murchison, which has become a major thoroughfare following the closure of the Picton to Christchurch leg of State HIghway 1. OPINION: ​New Zealand is a coastal country with challenging geography and it seems logical that we should use the “blue highway” far more than we have done in the recent past. Increasing our reliance on coastal shipping to move our freight, taking more trucks off our roads, is an essential step forward in building national resilience in the event of another natural disaster. Public support for considering alternatives to long-haul trucking is building in the wake of the Kaikoura earthquake, in part because we have now seen first-hand how essential it is to have a good plan in place for our transport infrastructure. Pacifica’s coastal ship Spirit of Canterbury offloads at Lyttelton late last year. The blue highway is always there, it’s free, there are no potholes and no chance of slips. Yes, the weather can be challenging, but then the weather can be equally problematic for our roads. Sea transport was a vital route between Auckland and Tauranga to Lyttelton following the closure of State Highway 1 and the rail corridor, and it remains so to some extent for what would have been rail freight. Data from a NZ Transport Agency State Highway Traffic Monitoring System telemetry unit on SH1 at Waipara shows an initial increase in heavy traffic in the period following the earthquake has now plateaued so much so that truck volumes are only slightly up compared to a year ago. This would indicate that most of the rail freight, rather than being put on trucks, must be going via coastal shipping. A number of freight forwarders have re-categorised what goods are being sent as just-in-time, or urgent freight, in order to reduce the amount that travels by truck. Perishable goods such as fruit and vegetables will always be time critical, but there are many items that were only being classified as such for cash-flow reasons, and this is where the industry needs to look at the bigger picture. 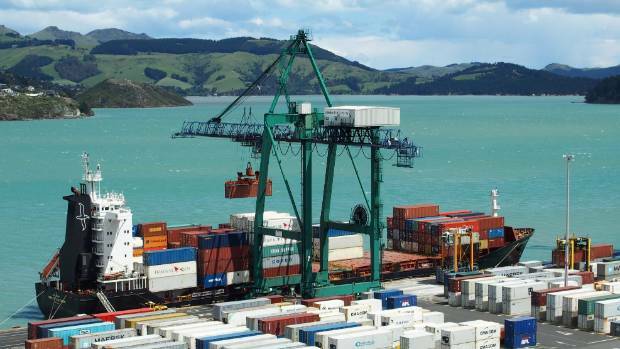 Ships can carry more freight in fewer trips for less money, and little time is lost: A ship travelling from Auckland to Lyttelton does so in a similar amount of time as freight travelling by rail and ferry. However, there are some challenges to overcome with regards to the current commercial model of the ports industry. One is that there is no financial incentive for operators to build more resilience and redundancy into their facilities. Where one operator might spend money on increasing resilience and struggle to make a return off that investment, another might not do this work and make more profit. That approach does not benefit our country, and this is something that needs to be addressed. Another issue is that while there is plenty of capacity to ship goods from north to south, this is not so in reverse. This is due to international lines being able to carry freight when continuing their journey and predominantly travel north to south. As the Marlborough Chamber of Commerce has pointed out, it would make us less vulnerable if we spread our goods and distribution centres more equally rather than, in Marlborough’s case, mainly sourcing our perishable supermarket goods from Christchurch. Another important benefit is that ships produce fewer emissions, and this is in line our obligations to reduce our emission by 2030 under the Paris Agreement on climate change. Relying on the sea, not just our roads, should be the way of the future.